Known more for its status as the launch of the (brilliant) Janvier story arc, “Crimeleon” exposes some essential clues about our detective that are frequently overlooked. Do you recall it was actually Deeks who assigned the moniker of “Chameleon” in the first place? Not surprising from the man enamored with nicknames! As usual, the team starts the day in the bullpen. However, this morning Deeks’ partner is concocting a healthy smoothie. (Wait. What? Wasn’t Deeks’ initially characterized as the more health-conscious of their duo? Of course, that’s not a stretch compared to his saccharine-surplused colleague.) It soon seems the “juice” was an effort of cunning mischief, which the malleable detective takes in stride. If Kensi is voluntarily taking the time and effort to craft a beverage for him (and initiate unquestionably flirtatious banter), then who is he to deny her selfless offering? In the end, as Deeks attempts to placate his partner, it is he who inevitably regrets the endeavor. In overcoming a near-choking and possible future gastrointestinal incident, it was worth it. Because at least it got her to smile. A small (personally harmful and humiliating) price to pay for such a valuable reward. Anyone ever notice that the very mention of a club raises the stakes among the team, particularly their cunning cop? However, which Deeks do we see and hear prior to his departure to Edison? He confesses he lied about Kensi. If this was simply a girl he was dating, why would that matter? Is he pro-actively avoiding any potential jealousy from Bartender Erin? (Oh buddy. Your days of dealing with jealousy haven’t yet begun.) Perhaps it’s simply for the sake of security, on which Sam has presumably (post-“Personal”) and thoroughly schooled him. Erin: I hope you get paralyzed in a car accident. Deeks: Ok. You, you look fantastic. You’re still obviously crazy. [She begins to hurl the lemons at him.] I’m gonna leave that and just go. But I’ll call you. [Whispering] Probably not. Deeks is expertly skilled in playing his mark, but how does he communicate his sincerity? Kensi has regularly seen both sides to him, but how can she be certain of his true intentions? The foreshadowing for the end of Season 4 is now clear in the detective pushing his partner to the point of frustration and her demands for him to say something he actually means. 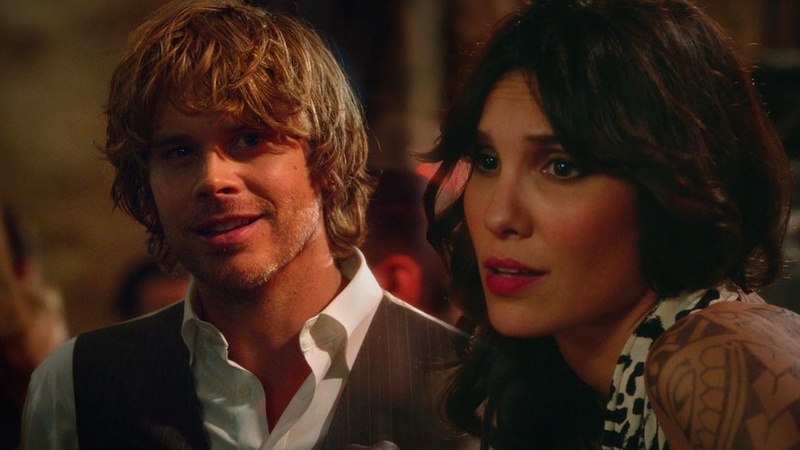 In one of, if not the last time Kensi was used as “bait”, the result was more productive for Deeks than the actual case. Even Sam and Callen can’t withhold commenting on Special Agent Blye’s striking appearance. A flowing mane, plunging neckline, retreating hemline, a chain of intricate tattoos, and always those legs that go on for days would attract the attention of anyone male or female. However, it’s what hides below the surface that genuinely intrigues Deeks. Our dashingly-dressed Deeks pointedly and happily observes the current offering of The Kensi Show as she expertly presents her skills in covertness, seduction, humor, inventiveness – and interest in another man! This prompts Deeks’ ego and manly-need to demand Kensi’s attention and positive appraisal of him. He boldly outlines a possible personal evening interaction with his partner (to obviously provoke a response) and brazenly does so with the comms wide open! Kensi: Yeh whatever. Like anybody would believe that we’re a couple. Deeks: Right. You are so not my type. The Lesson of “The Woody” – never put stems in a beverage. Better yet, never let Kensi “cook”. Deeks… in a club… wearing a vest. The end. Kensi’s clear admission and Deeks’ overwhelming joy.While most people point to the significant revelations discovered from Kensi’s words and actions in this episode, Deeks’ reactions and the way they affect him are equally important. We are presented with plenty of fun Deeks; however, in keenly studying what’s hidden below the surface indicates the influence his partner has on his heart and (shaggy) head more than his humor. These sometimes hesitant and sometimes involuntary steps Kensi is taking toward him is (at this point) all he needs to steadily apply his seemingly never-ending patience with her. Here we have a bold, noble, & always endearing Deeks. In that episode, during the bar scene with Erin, I thought he showed an affinity to tattoos, and she did have a lot of tattoos. Maybe that was the draw. I wasn’t surprised that Deeks said something to Granger. I particularly like how he started it and Hetty finished it. His grin at the end of that scene topped it off. Nice review! I enjoy reading about some of the underrated episodes. I can vividly picture Deeks’ smile at Kensi’s “I am too your type.” And I agree with Elizabeth about how his happiness when Hetty backed him up when he took on Granger. Feisty Deeks is hot.